ELECTRIC HIGH PRESSURE WATER WASHER CLEANER K3900 The K3900 2600psi Electric Pressure Washer is ideal for tackling a variety of light-to-medium duty cleaning jobs. Use it to clean cars, boats, motorcycles, RV's, ATV's, trailers, decks, barbecues, siding and more. Packed with a powerful 1400-watt motor, Kolner 3900 delivers up to 2600psi of cleaning power and a maximum flow rate of 7.8L/min, which means you'll get your cleaning chore done faster and easier with less strain and fatigue. Extend your cleaning reach with its 88cm wand, which features an adjustable spray nozzle to easily change the water pressure from an intense, zero-degree jet spray to a gentle, 45-degree fan spray. FEATURES Peak Pressure 2600psi Rated / Peak Flow 6.3 / 7.8 Lmin Rated Voltage 220-240V~50Hz Max Water Temperature 60C Input Water Pressure 0.3~0.7MPa 11cm Wheels for easy transportation Universal Threaded Connectors Sturdy Construction Compact design for easy storage when not in use Hose length - 8m Cable Length - 3m PACKAGE CONTENTS 1 x Electric High Pressure Water Washer Cleaner K3900 1 x Electric Washer 1 x LDG04 Spray-gun 1 x 8M Pressure hose 1 x 3M Power cord (attached) 1 x Detergent bottle Note: This order will be dispatched from our Melbourne Warehouse. This item may arrive in a separate delivery to the rest of your order. Usual dispatch time is 1-2 business days from order. ELECTRIC HIGH PRESSURE WATER WASHER CLEANER K4500 The K4500 3100psi Electric Pressure Washer is ideal for tackling a variety of light-to-medium duty cleaning jobs. Use it to clean boats, motorcycles, RV's, ATV's, trailers, decks, barbecues, siding and more. Packed with a powerful 1600-watt motor, K4500 delivers up to 3100psi of cleaning power and a maximum flow rate of 6.8L/min, which means you'll get your cleaning chore done faster and easier with less strain and fatigue. With its array of included cleaning accessories it provides everything you need for more cleaning power, function, performance and versatility. FEATURES Potable And Functional Sturdy And Durable 11 cm Wheels For Mobility Peak Pressure - 3100psi Rated / Peak Flow 6.8 / 7.5 Lmin Rated Voltage 220-240V~50Hz Max Water Temperature 60C Input Water Pressure 0.3~0.7MPa Ideal Pressure Cleaning Solution for Homes, Cars, Boats, RVs, Driveways & Decks PACKAGE CONTENTS 1 x Electric High Pressure Water Washer Cleaner K4500 1 x 8M Pressure Hose 1 x 3M Power Cord 1 x Detergent Bottle 1 x Fix Brush 1 x Angle Turbo Lance 1 x Filter Note: This order will be dispatched from our Melbourne Warehouse. This item may arrive in a separate delivery to the rest of your order. Usual dispatch time is 1-2 business days from order. ELECTRIC HIGH PRESSURE WATER WASHER CLEANER HOSE K5100 This K5100 Electric high pressure washer equipped with powerful motor generates peak 3800psi water pressure at 6.8L/min. water flow to remove dirt mold, moss and grim from the surface of patios, driveways, outdoor furniture, cars and more. It is the ideal pressure cleaning solution for garden, patio, cars, boats, RVs, driveways, decks and more, making cleaning tasks to be an easy job. This electric high pressure washer is manufactured for performance and durability. With its array of included cleaning accessories it provides everything you need for more cleaning power, function, performance and versatility. FEATURES Peak Pressure 3800psi Rated / Peak Flow 6.8 / 8.5 Lmin Rated Voltage 220-240V~50Hz Max Water Temperature 60C Input Water Pressure 0.3~0.7MPa PACKAGE CONTENTS 1 x Electric High Pressure Water Washer Cleaner Hose K5100 1 x LDG02B Spray-Gun 1 x 10M Pressure Hose 1 x 5M Power Cord 1 x 12M Extended Hose 1 x 5x Color Coded Angle Nozzles 1 x Floor Brush 1 x Fixed Brush 1 x Rotary Brush 1 x 2m Inlet Hose With Quick Connectors 1 x Angle Turbo Lance, 1 x Filter Note: This order will be dispatched from our Melbourne Warehouse. This item may arrive in a separate delivery to the rest of your order. Usual dispatch time is 1-2 business days from order. The K399TST cold water electric pressure washer producing 1600 PSI at 1.7 GPM is for industrial and commercial use; perfect for the professional who cleans hotels and buildings does auto detailing screen printing washes boats or vehicles. What distinguishes this Kranzle unit from the competition are the unique capabilities of the Kranzle pump and the uncompromising German quality. The Kranzle pump can run dry and bypass longer than its rivals making it more durable and reliable than the competition. The K399TST designed for daily use is equipped with a Kranzle APG industrial grade pump rated number one in independent laboratory tests. It is powered by a Kranzle 110 volt 15 amp TEFC electric motor with 35' cord and ground fault interrupter (GFI). Special features include auto on/off gun-jet control with 30 second delay combined with a safety shut-down after 20 minutes that prevents accidents and a unique high pressure soap design that delivers 20 percent more cleaning power at tip. Featuring a steel frame with a plastic cover that holds accessories and hose reel this pressure washer provides a convenient and powerful cleaning package. The K399TST comes with all the accessories you need to include: professional gun-jet lance 50' wire braided hose on a hose reel gauge safety coupler screw connections a knife-jet nozzle for high pressure wash and for difficult to clean dirt a hard hitting Dirt Killer turbo nozzle. With a cleaning power rating of 2720 cleaning units the K399TST provides the professional cleaner the latest in advanced pressure washing technology. The K499TST cold water electric pressure washer producing 2000 PSI at 1.9 GPM is for industrial and commercial use; perfect for the professional who cleans hotels and buildings does auto detailing screen printing washes boats or vehicles. What distinguishes this Kranzle unit from the competition are the unique capabilities of the Kranzle pump and the uncompromising German quality. The Kranzle pump can run dry and bypass longer than its rivals making it more durable and reliable than the competition. The K499TST designed for daily use is equipped with a Kranzle APG industrial grade pump rated number one in independent laboratory tests. It is powered by a Kranzle 110 volt 20 amp TEFC electric motor with 35' cord and ground fault interrupter (GFI). Special features include auto on/off gun-jet control with 30 second delay combined with a safety shut-down after 20 minutes that prevents accidents and a unique high pressure soap design that delivers 20 percent more cleaning power at tip. Featuring a steel frame with a plastic cover that holds accessories and hose reel this pressure washer provides a convenient and powerful cleaning package. The K499TST comes with all the accessories you need to include: professional gun-jet lance 50' wire braided hose on a hose reel gauge safety coupler screw connections a knife-jet nozzle for high pressure wash and for difficult to clean dirt a hard hitting Dirt Killer turbo nozzle. With a cleaning power rating of 3800 cleaning units the K499TST provides the professional cleaner the latest in advanced pressure washing technology. The K1200TST cold water electric pressure washer producing 2400 PSI at 5.0 GPM is for industrial and commercial use; perfect for the professional who cleans within a factory or food processing plant for use in a vehicle wash bay or on a farm washing animal pens. What distinguishes this Kranzle unit from the competition are the unique capabilities of the Kranzle pump and the uncompromising German quality. The Kranzle pump can run dry and bypass longer than its rivals as proven in independent laboratory tests making it more durable and reliable than the competition. The K1200TST designed for daily use is equipped with a Kranzle AQ industrial grade pump and is powered by a Kranzle 220 volt 25 amp three phase TEFC electric motor. Special features include auto on/off gun-jet control with 30 second delay combined with a safety shut-down after 20 minutes that prevents accidents and a unique high pressure soap design that delivers 20 percent more cleaning power at tip. Featuring a steel frame with a plastic cover that holds accessories and hose reel this pressure washer provides a convenient and powerful cleaning package. The K1200TST comes with all the accessories you need to include: professional gun-jet lance 65' wire braided hose on a hose reel gauge safety coupler screw connections a knife-jet nozzle for high pressure wash and for difficult to clean dirt a hard hitting Industrial Dirt Killer turbo nozzle. With a cleaning power rating of 12000 cleaning units the K1200TST provides the professional cleaner the latest in advanced pressure washing technology. The K1622 cold water electric pressure washer producing 1600 PSI at 1.7 GPM is for industrial and commercial use; perfect for the professional who cleans hotels and buildings does auto detailing HVAC maintenance screen printing or washes buildings boats or vehicles. What distinguishes this Kranzle unit from the competition is the unique capabilities of the Kranzle pump and the uncompromising German quality. The Kranzle pump can run dry and bypass longer than its rivals as proven in independent laboratory tests making it more durable and reliable than the competition. The K1622 is equipped with a Kranzle AZL industrial grade pump with built-in easy start and is powered by a Kranzle 110 volt 15 amp TEFC electric motor with 35' cord and ground fault interrupter (GFI). This pressure washer self primes and is freeze proof. The K1622 comes with: professional gun-jet lance 33' wire braided hose gauge safety coupler screw connections the Kranzle industrial Vario-jet (high pressure wash/soap) nozzle. An optional exit side chemical injection kit is available (part no. 97133765). With a cleaning power rating of 2720 cleaning units the K1622 cold water electric pressure washer provides the cleaning professional a lot of power in a small package. Dimension - 18 x 13 x 7 in. Item Weight - 42 lbs. The K2017T cold water electric pressure washer producing 1600 PSI at 1.7 GPM is for industrial and commercial use; perfect for the professional who cleans hotels and buildings does auto detailing HVAC maintenance screen printing washes boats or vehicles. What distinguishes this Kranzle unit from the competition are the unique capabilities of the Kranzle pump and the uncompromising German quality. The Kranzle pump can run dry and bypass longer than its rivals making it more durable and reliable than the competition. The K2017T designed for daily use is equipped with a Kranzle APG industrial grade pump rated number one in independent laboratory tests. It is powered by a Kranzle 110 volt 15 amp TEFC electric motor with 35' cord and ground fault interrupter (GFI). This pressure washer self primes and is freeze proof. Featuring a steel frame with a plastic cover that holds accessories and hose reel this pressure washer provides a convenient and powerful cleaning package. The K2017T comes with all the accessories you need to include: professional gun-jet lance 50' wire braided hose on a hose reel gauge safety coupler screw connections an industrial Vario-jet (high pressure wash/soap) nozzle and for difficult to clean dirt a hard hitting Dirt Killer turbo nozzle. With a cleaning power rating of 2720 cleaning units the K2017T cold water electric pressure washer provides a lot of cleaning power in a small package. The K2020 cold water electric pressure washer producing 2000 PSI at 1.9 GPM is for industrial and commercial use; perfect for the professional who cleans hotels and buildings does auto detailing HVAC maintenance screen printing washes boats or vehicles. What distinguishes this Kranzle unit from the competition are the unique capabilities of the Kranzle pump and the uncompromising German quality. The Kranzle pump can run dry and bypass longer than its rivals making it more durable and reliable than the competition. The K2020 designed for daily use is equipped with a Kranzle APG industrial grade pump rated number one in independent laboratory tests. It is powered by a Kranzle 110 volt 20 amp TEFC electric motor with 35' cord and ground fault interrupter (GFI). This pressure washer self primes and is freeze proof. Featuring a steel frame with a plastic cover that holds the accessories this pressure washer provides a convenient and powerful cleaning package. The K2020 comes with all the accessories you need to include: professional gun-jet lance 33' wire braided hose gauge safety coupler screw connections an industrial Vario-jet (high pressure wash/soap) nozzle and for difficult to clean dirt a hard hitting Dirt Killer turbo nozzle. With a cleaning power rating of 3800 cleaning units the K2020 cold water electric pressure washer provides a lot of cleaning power in a small package. 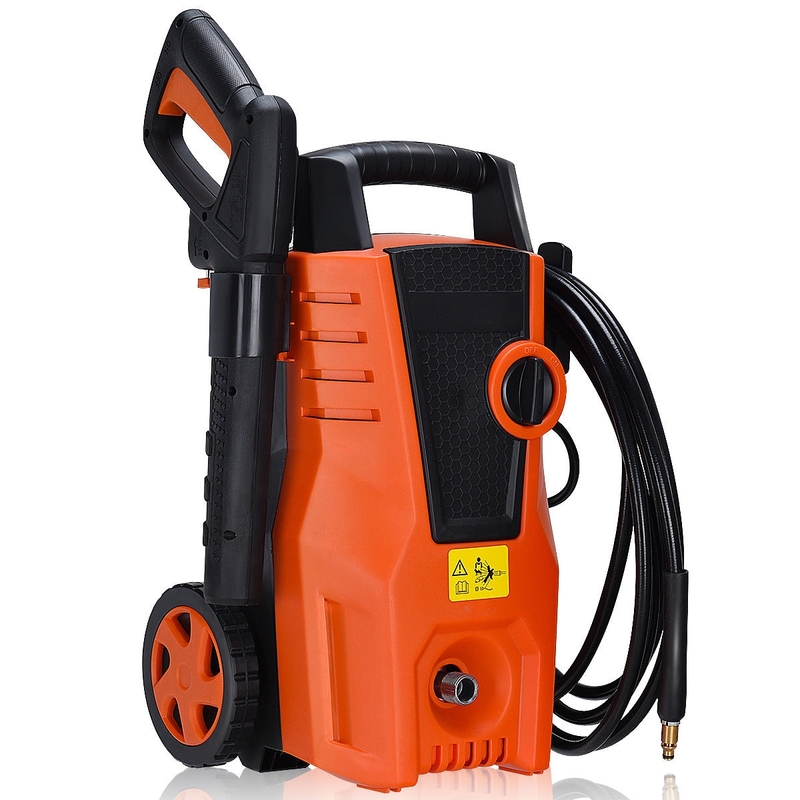 The K2020NG cold water electric pressure washer producing 2000 PSI at 1.9 GPM is for industrial and commercial use; perfect for the professional who cleans hotels and buildings does auto detailing HVAC maintenance screen printing washes boats or vehicles. What distinguishes this Kranzle unit from the competition are the unique capabilities of the Kranzle pump and the uncompromising German quality. The Kranzle pump can run dry and bypass longer than its rivals making it more durable and reliable than the competition. The K2020NG designed for daily use is equipped with a Kranzle APG industrial grade pump rated number one in independent laboratory tests. It is powered by a Kranzle 110 volt 20 amp TEFC electric motor with 35' cord. This pressure washer self primes and is freeze proof. Featuring a steel frame with a plastic cover that holds the accessories this pressure washer provides a convenient and powerful cleaning package. The K2020NG comes with all the accessories you need to include: professional gun-jet lance 33' wire braided hose gauge safety coupler screw connections an industrial Vario-jet (high pressure wash/soap) nozzle and for difficult to clean dirt a hard hitting Dirt Killer turbo nozzle. With a cleaning power rating of 3800 cleaning units the K2020NG cold water electric pressure washer provides a lot of cleaning power in a small package. The K2017 cold water electric pressure washer producing 1600 PSI at 1.7 GPM is for industrial and commercial use; perfect for the professional who cleans hotels and buildings does auto detailing HVAC maintenance screen printing washes boats or vehicles. What distinguishes this Kranzle unit from the competition are the unique capabilities of the Kranzle pump and the uncompromising German quality. The Kranzle pump can run dry and bypass longer than its rivals making it more durable and reliable than the competition. The K2017 designed for daily use is equipped with a Kranzle APG industrial grade pump rated number one in independent laboratory tests. It is powered by a Kranzle 110 volt 15 amp TEFC electric motor with 35' cord and ground fault interrupter (GFI). This pressure washer self primes and is freeze proof. Featuring a steel frame with a plastic cover that holds the accessories this pressure washer provides a convenient and powerful cleaning package. The K2017 comes with all the accessories you need to include: professional gun-jet lance 33' wire braided hose gauge safety coupler screw connections an industrial Vario-jet (high pressure wash/soap) nozzle and for difficult to clean dirt a hard hitting Dirt Killer turbo nozzle. With a cleaning power rating of 2720 cleaning units the K2017 cold water electric pressure washer provides a lot of cleaning power in a small package. The K2020T cold water electric pressure washer producing 2000 PSI at 1.9 GPM is for industrial and commercial use; perfect for the professional who cleans hotels and buildings does auto detailing HVAC maintenance screen printing washes boats or vehicles. What distinguishes this Kranzle unit from the competition are the unique capabilities of the Kranzle pump and the uncompromising German quality. The Kranzle pump can run dry and bypass longer than its rivals making it more durable and reliable than the competition. The K2020T designed for daily use is equipped with a Kranzle APG industrial grade pump rated number one in independent laboratory tests. It is powered by a Kranzle 110 volt 20 amp TEFC electric motor with 35' cord and ground fault interrupter (GFI). This pressure washer self primes and is freeze proof. Featuring a steel frame with a plastic cover that holds accessories and hose reel this pressure washer provides a convenient and powerful cleaning package. The K2020T comes with all the accessories you need to include: professional gun-jet lance 50' wire braided hose on a hose reel gauge safety coupler screw connections an industrial Vario-jet (high pressure wash/soap) nozzle and for difficult to clean dirt a hard hitting Dirt Killer turbo nozzle. With a cleaning power rating of 3800 cleaning units the K2020T cold water electric pressure washer provides a lot of cleaning power in a small package. The K700TST cold water electric pressure washer producing 2500 PSI at 3.3 GPM is for industrial and commercial use; perfect for the professional who needs to clean within a factory or food processing plant for a vehicle wash bay or use on a farm washing animal pens. What distinguishes this Kranzle unit from the competition are the unique capabilities of the Kranzle pump and the uncompromising German quality. The Kranzle pump can run dry and bypass longer than its rivals as proven in independent laboratory tests making it more durable and reliable than the competition. The K700TST designed for daily use is equipped with a Kranzle AQ industrial grade pump and is powered by a Kranzle 220 volt 25 amp single phase TEFC electric motor. Special features include auto on/off gun-jet control with 30 second delay combined with a safety shut-down after 20 minutes that prevents accidents and a unique high pressure soap design that delivers 20 percent more cleaning power at tip. Featuring a steel frame with a plastic cover that holds accessories and hose reel this pressure washer provides a convenient and powerful cleaning package. The K700TST comes with all the accessories you need to include: professional gun-jet lance 65' wire braided hose on a hose reel gauge safety coupler screw connections a knife-jet nozzle for high pressure wash and for difficult to clean dirt a hard hitting Industrial Dirt Killer turbo nozzle. With a cleaning power rating of 8250 cleaning units the K700TST provides the professional cleaner the latest in advanced pressure washing technology. The Martha Stewart Portable Electric Pressure Washer is just the right size to take everywhere you go when you want to clean stubborn gunk grease and grime. It's perfect for light- to medium-duty jobs around the house car deck dock boat cabin porch patio and more! The detergent tank lets you switch from a jet spray to a gentle soapy wash.